One of the main beliefs and principles of the Dow Theory is that major stock market indices when powering higher need to confirm with each other. 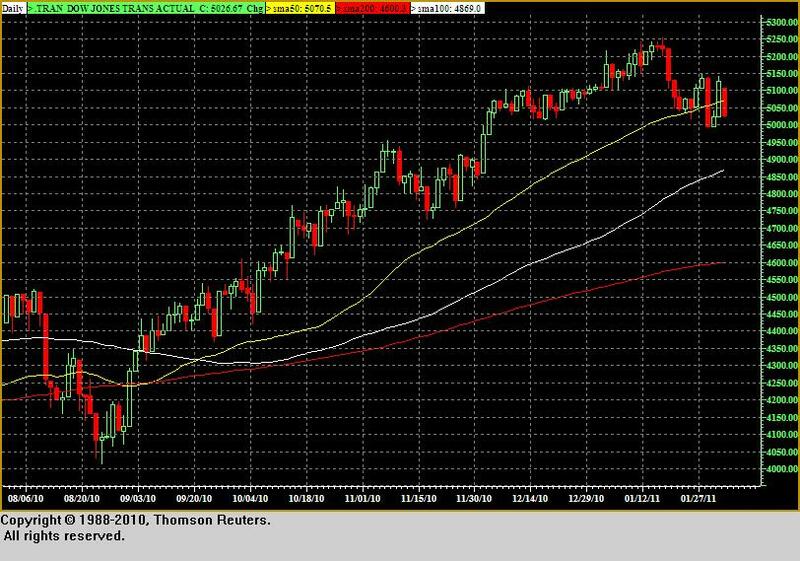 So far we have seen more of the same in the Dow, SP, and NASDAQ. All moving higher and making new highs. BUY THE DIP! But one of the most widely used and followed tenets of the Dow Theory states that when the Dow moves higher and is hitting new highs It should be confirmed with a higher Transportation average. What we have been seeing of late is that the Transports have been lagging the major indices. This can be for many reasons such as higher energy prices or I can be that we have a major divergence. 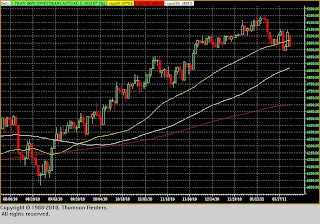 So when the SP is ramping and hitting new highs the Transports should also be powering higher and we have not seen that as of yet, in fact the Transports are now below its 50DMA. This to me is disconcerting. What to make of this? We an go obviously two ways here. Either this is a temporary blip for the Transports due to the ramp up in Oil because of whats going on in North Africa and the Middle East or this will just lead to a general breakdown for the SP. Also of note, going back to last Fridays sell off. That day was one of the first real distribution days in the market for some time. There was almost 90% more selling going to the down stocks then up, this also needs to be monitored because generally after a distribution day, the averages tend to rally for a few more days until they don't.